Mid 16th century word meaning to ‘look again or repeatedly (at)’): from French réviser ‘look at’, or Latin revisere ‘look at again’, from re- ‘again’ + visere (intensive form of videre ‘to see’). OED. I think I have spent many years getting revision wrong. My own ham-fisted attempts at school were neither based on evidence nor were they very successful. I enjoyed my subjects at school, I was motivated and engaged and I kept up with my homework (mostly) but revision was like kryptonite. I have never had a brilliant memory for details, I could recall the broad brush of an argument, concept or approach but none of the fine strokes of facts, writers or quotes. My school teachers never really talked about revision apart from ‘finding a method that works for you’. I think we had a generic session on different methods including using colour or recording your voice (learning styles – anyone?) but no explicit personalised coaching or explanation of how or why it works? By the time I got to Sixth Form the assumption was that you had made it this far so you were obviously doing something right, why don’t you do more of that. Whilst my memory is poor, my notes and studies have always been meticulously organised. I remember painstakingly reading and re-reading them, highlighting and underlining them and howling at the moon because my memory was so poor. My degree offered no further support for improving my revision techniques but I must have improved somehow as I started to do quite well in exams. I wondered what I was doing differently as I picked up the highlighters and carried on colouring the key quotes and passages in my core textbooks. The first time you encounter a topic, you fumble around trying to make sense of the concepts and make it fit into your existing schemas. The new words and concepts feel strange and alien and take a while to get used to. Revision is the chance to look at the same topic anew; with a fresh pair of eyes, make new links and examples, consider how it is similar and different to what you already know, see with your eyes wide open. Many of the revision strategies that students (and teachers) use do not produce much learning – instead they trick us into thinking we have learned more than we have. I am left wondering whether the word revision is not very helpful as it has too much baggage. It is a thing that is done at the end, the after thought and not something which is woven into the way we learn how to study. Do we need to rebrand revision? Perhaps relearning or reviewing might be more useful terms in explaining what needs to be done. During my PGCE, the science of learning and revision was curiously absent from the myriad of lectures about Bloom and Vygotsky. 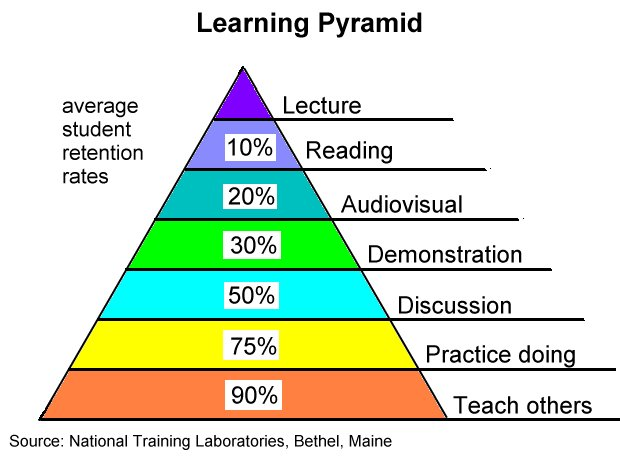 When it came to revision, we were offered the learning pyramid or cone of learning as a model. I was training to be a teacher at the time and this made perfect sense, intuitively if you have to teach someone something it will stick better than just reading about it. I remember feeling uneasy about the statistics cited but the overall model confirmed my pedagogical biases and confirmed the superiority of progressive rather than traditional teaching methods. Daniel Willingham argues this should be called a cone of shame; the model is not based on reliable evidence. There are so many factors which influence memory retrieval that it is a nonsense to present them in this order of priorities and attribute these statistics to them. Thankfully, we are in a different place now. There is a coherent canon of strategies emerging from cognitive science that provide a more evidence-based approach to revision. It is clearly the case that not all methods are equal. Some are far superior to others and some may be time-consuming and ineffective. One of the key influences on my thinking has been the work of John Dunlosky. Dunlosky et al suggest a range of effective and less effective strategies to use in revision. Dunlovsky’ do’s and don’t are nicely abridged in Alex Quigly’s Throw Away Your Highlighters. For me, highlighters can represent how our habits of teaching and learning can go unexamined and how we can too easily waste time and money each year by not being truly critical about our practice in the classroom. Alex is not wrong. For too long, too many of our revision tactics have been at best ineffective and at worst a waste of time and effort. We can do better than this. Revision and relearning are too important to leave to chance. Yana Weinstein & Megan Smith (The Learning Scientists) have reduced the cognitive research into 6 key strategies that can make a difference. Oliver Cavigliolo has turned them into fantastic info-graphics that should be the basis of all future discussions about revision. Each strategy is clearly explained with key research evidence provided. Research shows that spacing out your learning over time rather than cramming at the last minute is the key to success. This means you need to plan you learning, five hours spread over two weeks is far superior to the same five hours spread out all at once. Create small spaces of time for study and do a little bit at a time so it all adds up. Switch between ideas while you study. Don’t study one idea for too little or too long. Go back over ideas to make sure you understand them. How to develop your understanding. As you study ask yourself questions which get you to explain and describe ideas with as many details as possible. Make connections between different ideas, think how concepts are similar and different. Try to apply the ideas and concepts to your own experiences and memories to make stronger connections. Use specific examples to understand abstract ideas. Collect examples from your textbook, class notes or that your teacher has used in class to demonstrate a concept. Create your own relevant examples for the learning. Combining words with visuals. Develop different ways to represent the information visually for example an info graphic, timeline, diagram or cartoon. Put the text away and try and describe the concepts from the visuals. Eventually, attempt to draw what you know from memory. How to consolidate your knowledge. Practice bringing information to mind. Use frequent, low-stakes testing and quizzing to improve your learning. Use flashcards, key words, draw a diagram from memory or multiple choice quizzes. Don’t only recall words and definitions, try to recall main ideas and how things are related or different from one another and new examples. The teaching and learning team at Sandringham School have developed a rather neat way to embed all of these ideas. The Sandringham Memory Clock usefully portrays revision as a process that involves all the ingredients of evidence-based cognitive science. Revision is not just made up of isolated activities like flashcards but needs to be built into a cycle of review, practice, checking, retest, relearn, repeat. What have I learned about revision? By leaving revision to the end of the course and allowing students to do ‘whatever works for them’ we are doing them a disservice. If we are to maximise their memory potential we need to arm them with the techniques of cognitive science and consider rethinking how we structure linear learning. The science of learning teaches us that we should perhaps build in more explicit repetition along the way. The revisiting of topics and concepts should not be left until the end of the course, end of units, end of term. We need to provide lots of opportunities for revision and relearning along the way. Fantastic summary. Should we be sending this to our students?